A friend of mine has a little boy who just turned 5. 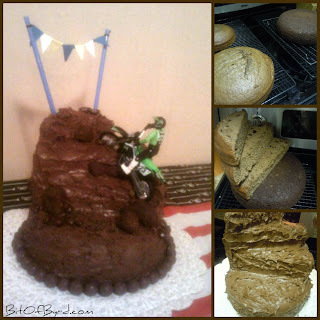 At 5 he loves what his dad loves and so the request was made for a "motox" cake. I had no idea what that meant but after some clarification I found out it meant motocross. So I did what I always do before planning a theme. I went to Pinterest to see what others had come up with. I was actually a little sad at the "motocross", "dirt bike" search results. But I made my Motocross Theme Board and started planning. That looks cool right! And they used a lot of other food items, like coco puff cereal and donut holes. But sadly when I went to the source page, Disney Family Fun, it was just words and no pictures. I made the cake so I thought I would show you how I did it. see how nicely they came out of the pans! Dont put the other 'half' of this cake in the 'extra' pile because it will be a layer. But save the tops. Once I find the angles that work for me I frosted halfish of the bottom layer. Stack layers CUT side down. When I did my dry run I just stacked them upside right. But when you are frosting a cake all the little crumbs get in it if you dont chill it and fast frost it and I just didnt want to do that. So when I stacked the cakes I stacked them with the bottom sides up so I would have a nice crusted surface to frost. Worked great! For the topper I was going to make it edible like in the pinspiration but I couldnt find fruit roll ups at the store I was at and didnt want to stop anywhere else. I used straws, floss and paper and a few drops of hot glue to make my flags. To make the cake look finished before adding the bike I put Whoppers around the bottom. The smaller 'rocks' you see are Rasinets. The large boulders are cake balls made by mashing some frosting into the extra cake until it was dense enough to hold it's shape. Check out the bike I put on top! I found that bike at Walmart for $10. Hope you like the Dirt Bike Cake. The boys LOVED it. Disclosure: The links in this post are affiliate links and making purchases through these links supports Bit Of Byrd.